Chinese Taipei National President’s Cup was held for the women and men boxers in the city of Kaohsiung. The junior, youth and elite age groups each could fight in the National President’s Cup where Chinese Taipei’s stars such as Lin Yu Ting, Chen Nien Chien, Huang Hsiao Wen and Lai Chu En all won the gold medals. Chinese Taipei impressed in the Jakarta 2018 Asian Games and has done their historical steps with gold medals at the AIBA Women’s World Boxing Championships in New Delhi. The President’s Cup is Chinese Taipei’s main national competition and closes the boxing year in the country. The women elite competition of the Chinese Taipei National President’s Cup was world class in Kaohsiung. The first gold medal of the female part of the President’s Cup was achieved by two-time AIBA Women’s World Boxing Championships competitor 22-year-old Chin Chien Hui who defeated Lin Pei Fang in the final of the light flyweight (48kg). 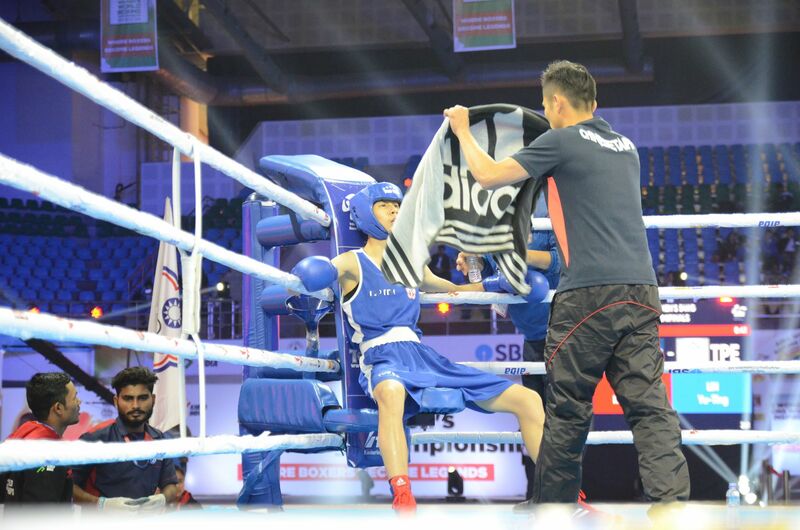 Pin Meng Chieh is the most experienced female boxer in Chinese Taipei who attended in several AIBA and ASBC competitions therefore her skills were too much for Tsai Chih Chen at the flyweight (51kg). Lin Yu Ting is the defending AIBA Women’s World Champion and the reigning ASBC Asian Women’s Champion at the bantamweight (54kg) and continued her impressive winning path also in the national stage. AIBA Women’s Youth World Boxing Championships silver medallist Huang Hsiao Wen used her best fighting distance to beat Lin Li Wei Yi in the final of the featherweight (57kg). Wu Shih Yi is another well-developed female boxer in Chinese Taipei who turned to 20 this year and following her silver medal at the Ulaanbaatar Box Cup she was too technician to Chen Ching Hsuan in the final of the lightweight (60kg). The next gold medal was achieved by Liu Chia Chun at the light welterweight (64kg) where she was too quick for Pan Yen Ni in the title contest. Chen Nien Chin won Chinese Taipei’s second gold medal at the AIBA Women’s World Boxing Championships and the 21-year-old boxer was fantastic and confident in her welterweight (69kg) final against Lin Ya Hsuan. AIBA Women’s Youth World Boxing Championships bronze medallist 19-year-old Yang Ya Chu won the title of the middleweight (75kg) before Chen Pin Tsen became champion at the heavyweight (+81kg). FISU University World Boxing Championships silver medallist Tu Po Wei is only 21 but he is one of the most experienced male boxers in Chinese Taipei. The young hope, who attended also in the Jakarta 2018 Asian Games, was too strong for Lo Yu En in the final of the men’s light flyweight (49kg). Another FISU University World Boxing Championships silver medallist Hung Chuan Hsun and AIBA Youth World Boxing Championships quarter-finalist Hsu Cheng Yu met each other in the junior and youth age groups in the recent years. The battle of the two teenagers was excellent in the final of the flyweight (52kg) which was won by Hung in a spectacular title fight. FISU University World Boxing Championships bronze medallist and ASBC Asian Confederation Youth Boxing Championships competitor Chen Po Yi won the gold medal at the bantamweight (56kg) following his success over Chen Ping Tsun. National Games silver medallist Lin Yu Chun captured the gold of the lightweight (60kg) after beating Li Nien Hua in the final. Chinese Taipei’s first male Olympian boxer since 1996 was Lai Chu En in Rio de Janeiro who moved up to the light welterweight (64kg) in the recent weeks and defeated 20-year-old Sung Wei Chieh in the final. 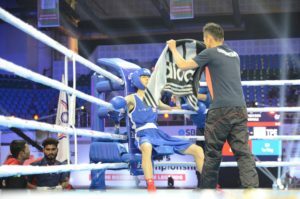 Another key contest in the President’s Cup was held between ASBC Asian Confederation Youth Boxing Championships quarter-finalist Kan Chia Wei and defending champion Li Sheng Ta at the middleweight (75kg). Kan, who is only 20 but involved to the national team nearly three years ago, was stronger than his opponent this time.